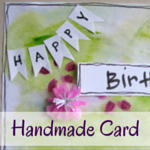 Yesterday I posted a super cheap and uber easy tutorial for your children to Create gorgeous water coloured backgrounds for some emergency (or not) handmade gift cards and wrapping paper. Today I want to show you different ways to use these backgrounds. I hope this helps you occupy your children for a few more hours these holidays and perhaps get a little more organised for the months ahead. If your family does make some cards – I would genuinely love to see them. Put a link in the Comments below or share on the Purple Paper House FaceBook site. Go on, share the love!